Spartans were left to rue two set-pieces and a missed spot kick on Saturday afternoon – as Leamington’s 2-0 win inflicted Blyth’s fifth defeat in six Manarama National League games. Jack Edwards got The Brakes off to the perfect start, when he lashed home Kieran Dunbar’s free kick with just six minutes gone. Dunbar then produced a fantastic 33rd minute free kick to get on the scoresheet himself. The hosts were awarded a way back into the game with 25 minutes still to play, but Spartans’ miserable afternoon was summed up when Bradley Fewster saw his penalty kick saved. With the Spartans flag flying at half-mast, Croft Park fell silent prior to kick-off to pay their respects to club historian and loyal supporter Ken Sproat – following the tragic news of his passing earlier in the week. The hosts had a good early chance, when Jarrett Rivers was fouled at the edge of the box on just three minutes. Robert Dale stepped up to fire a shot at goal, but could only find the Leamington wall. The visitors had made a long journey up from Warwickshire, but they were anything but sluggish in their start – as they opened the scoring with just six minutes on the clock. Dunbar fizzed a free kick from the left across the face of goal, which picked out Edwards at the back post. With the easiest of tap-ins to break the deadlock, the striker opted instead to lash the ball hard into the roof of the net. Spartans tried to get themselves back on level terms, but they were undone by another set-piece on 33 minutes, with Dunbar producing a sublime free kick to double Leamington’s lead. The midfielder curled the ball around the wall and in off the upright, leaving Jameson with no chance to stop it. 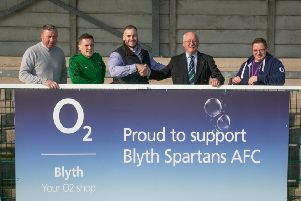 It was a long way back for Blyth, but on 65 minutes they were handed a lifeline as a push in the back of Aaron Cunningham at a corner had referee David McNamara pointing to the penalty spot. Fewster stepped up to take the spot kick, but could only watch as Breeden dived the right way. Wrightson then had two good chances for Blyth but was unable to find the target as the match slipped away from them.